extended. There are total 95 posts of Law Clerk vacancies available in High Court of Allahabad. 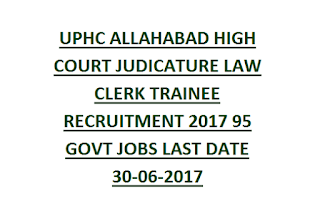 Last date for submitting application forms for this Allahabad High Court Law Clerk Jobs recruitment is 30-June-2017. Selection for Law Clerk Recruitment 2017 of Allahabad High Court is based on purely personal interview only. For more details regarding available vacancies, age limits, educational qualifications please see below given information. There are total 95 vacancies available in Allahabad High Court Judicature. The candidate must be a Law Graduate Degree from a recognized board or University recognized by bar council of India. Those who are studying five years integrated course of final year they are also eligible. Computer Knowledge of Data Entry, Computer Operations and word processing. As on 01-07-2017 the candidates age limits should 21-26 years. The selection for this Allahabad High Court Recruitment will be based on performance in the Personal Interview. The candidates have to pay Rs.300/- to purchase the application from High Court of Judicature at Allahabad and from its Lucknow Bench. 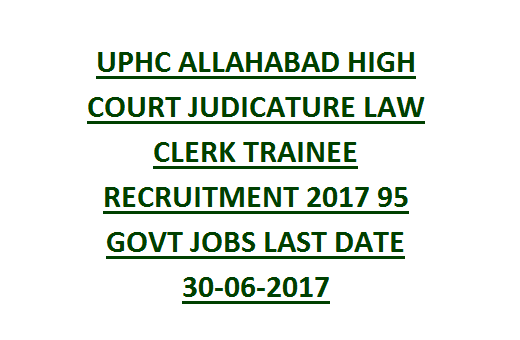 Click here to see the official notification of Allahabad High Court Law Clerk (Trainee) Recruitment 2017.